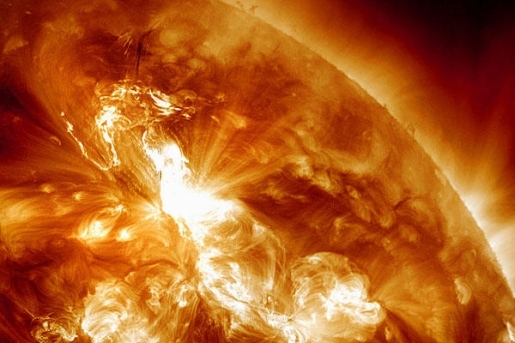 This is what a solar flare looks like, according to NASA. So that big solar storm we had the other day actually had some repercussions in the real world, namely for airline companies. As the magnetic activity continues, commercial airlines are being forced to make adjustments on the fly to many of their so-called polar routes. Typically, a flight from Detroit to Asia means that the airplane will be flying north, through the Arctic, in an attempt to shave hours off the journey by using the shortest route. Well, not for awhile: Delta and United Airlines have both had to shift certain polar routes south due to interference caused by solar radiation. Of the carriers, Delta altered the most flights, with United only changing one route on Monday. America’s other major commercial airliners had no need to alter services due to the storms. Delta’s changed routes added 15 minutes or so onto the flying time of their polar routes; I’m sure no one on the day-long flight from Detroit to Tokyo (or wherever) noticed the additional quarter-hour. After all, it could have been a whole lot worse.